Destination wedding on your mind and the serenely gorgeous Thar Desert is your ultimate choice?! But, are destination weddings affordable? Will it be feasible for you and your guests? The questions are endless but we have the answers for your right here! Destination weddings are great money-saver options compared to having a traditional wedding in your hometown. It's true! Don’t believe us? Read this. When having a wedding away from home, another big concern that arises is convenience and comfort of your guests, as well as you and your family. If you think booking a grand palace in a place like Bikaner to ensure the ultimate comfort and convenience of all attendees will not come cheap, you’re in for a major surprise. For couples who’re are looking for wedding venues, wedding lawns or banquet halls in the city, we’ve handpicked our favourite destination wedding palaces in Bikaner that come within budget, offer majestic facilities, along with an ambiance that’s worth every penny. A charming blend of Indian and European style of architecture welcomes you at one of the best hotels in Rajasthan. Located inside one of the most beautiful palaces in Bikaner we have Hotel Sagar, which is a preferred choice of most couples looking to celebrate a destination wedding on a budget. This wedding venue offers a large lawn area for outdoor events and a banquet hall for private celebration. Accommodation facilities are also available. Hotel Sagar does not provide wedding associated services in-house, thus allowing outside caterers, decorators, DJ and alcohol provisions on the premises. Located close to Bikaner Railway Station, this wedding palace is a perfect location if you’re looking for convenient travelling. One of the most impressive palaces of Rajasthan, the Lallgarh Palace is an epitome of the bleak and rugged reality of the harsh Thar Desert around Bikaner. For couples who’re looking for a palace that has royalty oozing out of every brick of the architecture, the Lallgarh Palace is your dream venue. Featuring Indo- Saracenic architecture, this wedding palace in Bikaner guarantees a wedding that is no less than an imperial wedding like Jodha Akbar. The venue has close proximity to every major airport, highway, railway station and bus stand in the city. Like Hotel Sagar, the Lallgarh Palace too permits outside vendors on the premises. 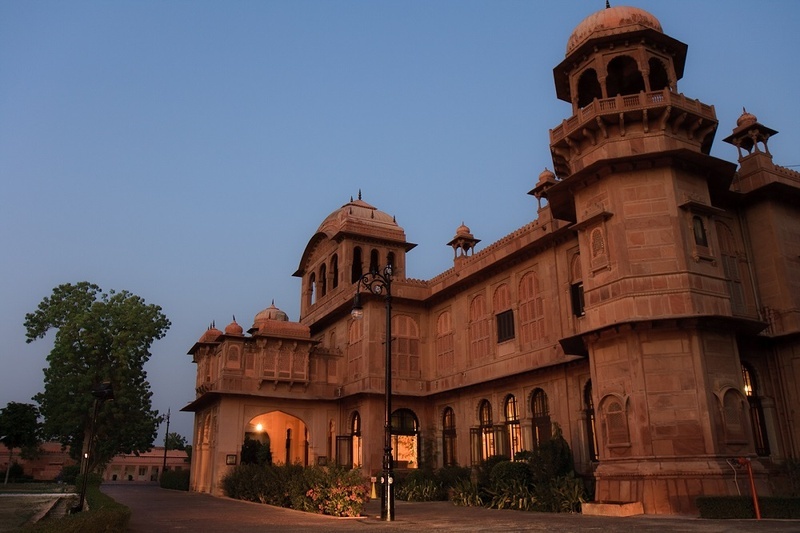 The Laxmi Niwas Palace in Bikaner has been a host to many high profile weddings. The highlights of the venue are the marble-top terraces and pavilions that create a picture-perfect romantic setting. If a big fat Indian wedding is on your mind, look no further than this majestic wedding palace in Bikaner. At this venue, you’re allowed to make your own food, decoration and music provisions. Should you need unique arrangements made, such as tete-a-tete dinners on the lawns or private kalbellia performances, their internal management team will ensure wholesome entertainment. A jewel in the Thar Desert, Gajner Palace is a sprawling majestic venue that is sure to please the likes of an adventurous couple. This lakeside complex adjoins a sanctuary, enabling you to fully explore Rajasthan’s best-kept secrets. The wedding palace that is located at a 30-min drive away from Bikaner is spread over 6000 acres of land giving you a spacious venue to host a regal celebration. The venue features multiple event spaces to hold your pre-wedding and wedding functions. Along with taking care of your décor, catering and audio/video arrangements, Gajner Palace offers entertainment facilities, such as Kalbelia performances, bone fire, puppet shows, fireworks, etc. To book this venue, click here or call 76-66-77-88-99.